Scripted Performance Evaluation Shakers Performed on 24/03/03 Katie Heskins 8100 The play that I decided to perform for my GCSE Drama coursework scripted piece was entitled 'Shakers' and it was written by John Godber and Jane Thornton. Written for four female actors, the play explores the issues surrounding life in a male-dominated world during the 1980's when unemployment had never been higher. The play, which is set in a cocktail bar, has 24 scenes in total. For our assessment, we decided to perform ten scenes: 1-8, 10 and 23. During the play, the four waitresses, Carol (the character I played), Adele, Nicki and Mel, switch from role to role, playing the many characters that come into Shakers. The play's strongest scene that we performed was one in which two of the waitresses were playing males - 'dressed up, and out for a good time'. The two men mock the stereotypes that there are of males by addressing rude comments to their waitress and calling her 'lovey'. I think we made this scene so effective because we attempted making these characters so outrageously crude that we created humour for the audience in doing so. We purposely made our voices deep, our words quite slurred and our actions very sloppy. ...read more. I found this easy to do because it was embarrassing doing this in front of an audience and therefore I could understand how my character would have felt having to get changed in front of a room full of people. The factor that let our play down tremendously was the length of time it took us to change between scenes; at some points, the audience would wait for up to three minutes between scenes. The reason why this happened was because we could not see our clothes during the blackout and had to rummage around and we couldn't see what we were doing. If we had a torch or a small lamp this would have helped run things more smoothly. Also if we each had our own separate areas behind the stage to put props and costume down we would not mistake other people's clothes for our own. This certainly let my performance down during scene 6 (Mel's first day in the kitchen) because I ran on stage about a minute late because I couldn't find my costume. I luckily didn't have any lines, but it would have looked bizarre to the audience. This scene, however, was a very weak scene as it was. ...read more. I especially enjoyed playing Trev because this allowed me to show a completely different side of Carol. I was able to be very crude and vulgar - everything from my walk and facial expressions to my actions and gestures had to be very over the top to create humour for the audience. Even the way in which I communicated with other characters had to be different from how I would if I was playing a female character. I winked at the waitresses and looked them up and down as would a stereotype of my character. Another scene which I enjoyed performing in was scene ten when Carol is outraged by the fact that Nicki is wearing the shorts that they all had agreed they wouldn't wear. The person who I performed this with and I found this a great scene to incorporate a more serious mood. Because my character was so angry, I had to show this through my voice (I would speak clearly, but quickly), my facial expressions (when speaking to Nicki I stared at her defiantly, widening my eyes) and my actions (I did things quickly, I walked tall etc). These factors helped contribute to adding a tense atmosphere to the scene. At points I think I did things too dramatically and I would be wary about this if I repeated this scripted piece. 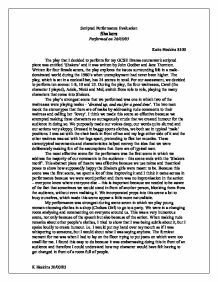 K Heskins 30/03/03 ...read more. This play sets out with an objective, and through all the laughs and tears it has rose to the top and succeeded. Carol is the college graduate who can't get her life together, Adele, a quiet single mum to a daughter, whose life-long ambition is to work in a travel agent. I would say our play was a dark comedy as a lot of the humour was from subjects that were not nice, like being drunk and sick. We also had aspects of kitchen sink dram, but with a modern twist, as working class people told their stories. Making the pact meant spilling their blood - sealing their fate or merely tempting it - it is hard to tell. Much of the symbolism seen in the production was not always that which was written in the script. For example in the production, as I have already mentioned, the narrator handed the bible to Mrs. Drama Evaluation - Armistice Day Performance. My character was an 11 year old girl called Rosie; she had lost her mother in an air raid on London and had to be evacuated whilst her dad fought in France. My monologue told of how lonely and afraid she was and of how she wanted her dad to come home. G.C.S.E Drama: Evaluation of Naturalistic Improvisation. One positive point in our play was that all the character's objectives were clear. For example Scot's friend's objective was to get revenge on David, by creating distress amongst the family. The mother's was to conceal the fact that Scot was her ex-fianc�. When Lindsey finally agreed to pass the note she stood up confidently and said "yeh...I'll do it!"